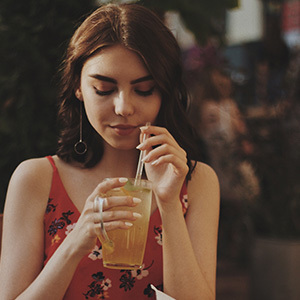 Soda is a trending wellness topic — you always hear that you shouldn’t be drinking it, but do you know the ins and outs of why? In this final article about soda (check out parts one and two), we’ll dive into its effects and provide practical tips to finally cut the frothy libation. Stay in the know with healthy living tips and information with Amicus. And, if you’re looking to balance your blood sugar, get better sleep, or find digestive relief, give Sugar Check a whirl! Forty is the number of grams of sugar in one can of soda, which glaringly exceeds the daily recommended amount — for men, it’s 38 grams and for women, it’s 25 grams. Then concoct a drink with sugar and caffeine and you have a recipe for a health disaster and addiction. There are studies that reveal sugar as being as addictive (or even more so) as cocaine. The difference between the two substances is soda is a societal norm — you are introduced to it at a very young age, it is easily accessible and cheap. Sure, sugar is demonized. It is sometimes used as a fearmongering tactic but as more research is being done, more light is shed on its destructive effects. Now that we have more information on the bubbly beverage, we’ll touch on the ways you can ditch your soda addition in the new year! Stress and sugar consumption go hand-in-hand. People turn to comfort when they have relationship problems, are sick, have a bad day at work, etc., and this is often in the form of sugar. If you’re chronically stressed, combat this first. If you are stressed and trying to deal with stressful events and people, it will only put a damper on your progress. So, take inventory. What are the major stressors in your life? Do you need to set boundaries? Do you need to commit to less? Ask these tough questions and begin to address your stress through therapy, yoga and meditation, exercise, etc. There may be other areas of your diet that you need to clean up in addition to your soda habit. If sugar is a sore spot, try and break your overall sugar addiction. The best way to do this is to prepare your own meals (that way you know what exactly is going into your meals), eat whole foods (protein, veggies, and healthy fats), and avoid processed foods and beverages. Start with one meal a day and gradually work up to healthy eating habits for all three meals. We’ll even bet that as you eat healthier and your taste buds are restored, super sweet things will be unappealing. Sugar cravings are also a result of nutrient deficiencies, so pay attention to what you’re craving. Craving baked goods and sweet treats could indicate a magnesium deficiency. If you’re a chocolate addict, your zinc levels could be low. Talk with a nutritionist about supplementation with these minerals and see if they help decrease your sugar cravings. Cut back your soda consumption. This is tough, taking measures to cut make means you’ll be drinking less of the stuff you love. Do you revel in the black or white type of thinking or do you exist more in the gray? This can make a big difference in breaking your soda addiction. If you’re an all-or-nothing type of person, quitting cold-turkey may be the most beneficial approach, and if you’re more in the gray, cutting back slowly may be the best path. Begin to dwindle your soda consumption. For example, if you drink soda with each meal, begin to cut it out one meal at a time. Only have soda on the weekends or when you meet up with friends. Soda presents a problem for our health because of the amount of added sugar it contains. Because a can of soda contains 40 grams of sugar, having that as a part of your daily nutrition already pushes the limit of the recommended daily limit of added sugars. The more soda you consume and the longer you drink it can set you up for serious health issues such as type 2 diabetes, heart disease, and obesity. The fortunate news is, you can work towards breaking your soda addiction. Start today! If you’ve made it through this three-part series on soda, congrats you’ve absorbed a lot of information! Ditching any habit can be tough, but hang in there, wellness is a journey! For more information about our products or to try Sugar Check, reach out to us today!